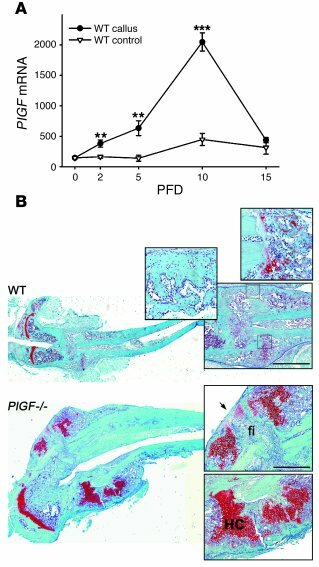 Impaired fracture healing in PlGF-deficient mice. (A) Temporal analysis by qRT-PCR of PlGF mRNA expression during semistabilized fracture healing in WT mice. Fracture calluses (n = 9–12) and contralateral control tissues (n = 5) were harvested at PFDs 0 (no fracture), 2, 5, 10, and 15. Values represent the number of PlGF mRNA copies per 1,000 copies of hypoxanthine-guanine phosphoribosyltransferase mRNA. **P < 0.01; ***P < 0.001 versus control. (B) Safranin O staining of WT and PlGF–/– fractured tibia at PFD13, visualizing cartilage proteoglycans (stained red). In contrast to WT mice, PlGF–/– mice exhibit a large callus with massive accumulation of hypertrophic cartilage (HC), fibrous tissue (fi) at the fracture line, and lack of bony bridging (arrow). Magnified views of the WT callus show scarcely detectable cartilage and presence of bony bridging (blue lines represent callus contours). Scale bars: 1.5 mm.